W:.B:. 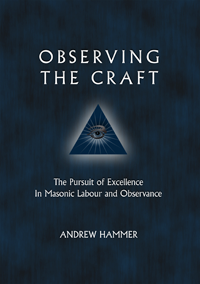 Andrew Hammer, author of Observing The Craft, will be speaking this Saturday evening, June 11th, at Milan Lodge No. 323 in Ann Arbor, Michigan. The Feast of St. John the Baptist dinner will take place at the Comfort Inn Chelsea, 1645 Brown Road, Chelsea, MI, with registration beginning at 6:00 PM, reception at 6:30, and dinner at 7. Cost is $75, and is limited to 72 attendees. Price includes a complimentary copy of â€œObserving the Craftâ€. For more information see the website, or contact contact Bro. Jake Foster at 734.770.2105 or fosterj323@gmail.com. Andrew is a Past Master of Alexandria-Washington Lodge #22 in Virginia, and a member of the Board of Directors of the Masonic Society.